Garth Brooks and Trisha Yearwood to Appear at HGTV Lodge During 2017 CMA Music Festival! 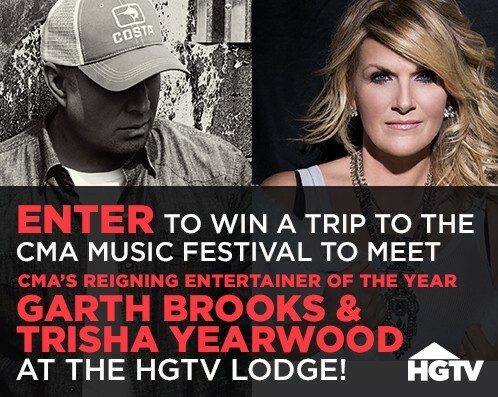 Garth Brooks and Trisha Yearwood will appear at the HGTV Lodge at CMA Fest 2017! Various radio stations have been promoting a listen to win contest with a meet and greet with Garth and Trisha at the HGTV Lodge as the prize! The date and time of the appearance has not been released, but we suspect that it will occur on Thursday, June 8th at about 3 pm, filling the gap between Keith Urban and Brothers Osborne. The Garth Brooks World Tour is scheduled to be in Montana from June 9th - June 11th. Check your local country radio station's website to see if they are promoting the contest for your chance to enter to win!